In the six months since Donald Trump was inaugurated, it’s become painfully obvious that along with not knowing that a pair of glasses do not belong at the tip of one’s nose, Senate Minority Leader Chuck Schumer is making his decisions based on politics, rather than what’s good for the United States or his constituents in New York. As a result (according to the latest Sienna poll) Schumer’s favorability ratings among NY voters are at the lowest level ever. While 53% is pretty good for a favorability rating when one looks at the fact that it was at 67% only eight months earlier, team Schumer must be getting a bit concerned. NY’s other senator, Kirsten Gillibrand (who voted for the Iran deal which was rejected by most New York Voters) should be concerned also, not because of a lack of favorability, but because when asked 33% of NY voters had now opinion. This leaves the NY GOP (if they ever get their act together) and opportunity to find a good candidate and define Gillibrand before she defines herself. Part of the reason for the Schumer fall-off is his obsession with Russia. New Yorkers are beginning to suffer from Russki overload. While they are concerned the reported Russian attempt to sway the 2016 presidential election, that number is inching downward. It now stands at 64%, down slightly from the 68% two months ago. Where you see the real trend is when Sienna asked about the anti-Trump witch hunt, er..I mean the Russian investigations. By a 64-35 percent margin, voters say they’re concerned about Russia’s attempt to sway last year’s election, down a little from 68-31 percent in May. And while 56 percent want a thorough investigation concluded, down from 68 percent in May, 41 percent say it’s been investigated enough, up from 30 percent. 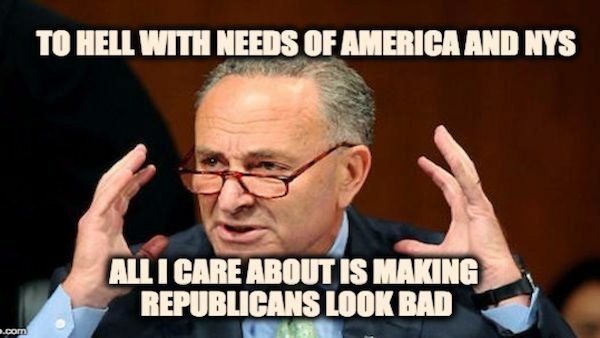 In the end, such is Chuck Schumer, the needs of America do not matter, the needs of New York State do not matter–in fact the only thing that matters to Chuck Schumer is sating the extreme left-wing of the Democratic Party by making the GOP look bad. And voters are beginning realize his real objectives.